Dr. Matthias Gromeier's original notion that polio virus (image) might be used to kill cancerous tumors was met for some time with much disdain. But now, two decades later, use of the virus known for crippling and killing millions is showing promise against one of the deadliest forms of cancer - glioblastoma brain tumors. In a 60 Minutes story airing on CBS the evening of March 29, 2015, reporter Scott Pelley meets two patients participating in the phase 1 clinical trial of the polio-virus-based anti-glioblastoma therapy, who have been declared cancer-free by doctors. "I got a range of responses, from crazy to you're lying... most people just thought it was too dangerous," said Dr. Gromeier, an Associate Professor of Surgery and Associate Professor in Molecular Genetics and Microbiology at Duke, where he has been for the last 15 years, when he started pushing his idea to attack tumors with the polio virus. One of those naysayers was Dr. Henry Friedman, a neuro-oncologist who is now the Deputy Director of the Brain Tumor Center at Duke University where the phase 1 clinical trial of the polio-virus therapy is now being carried out. "I thought he was nuts," Dr. Friedman told Pelley. "I really thought he was using a weapon that produced paralysis." That was 15 years ago. Today, after research, animal trials, and now this human clinical trial, Dr. Friedman is more than optimistic. "This, to me, is the most promising therapy I have seen in my career, period," said Dr. Friedman who has been researching a cure for glioblastoma for more than 30 years. Dr. Gromeier's research yielded a genetically modified polio virus that could be used safely in animals and now, it seems, in humans. The concept is that the polio virus binds to a surface molecule that is present on the surfaces of many solid tumors, including glioblastomas, and can thus gain entry to the cancer cells. The modified polio viruses are directly inserted into the glioblastoma during a guided surgical procedure. 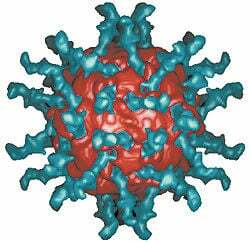 A portion of the normal polio virus genome has been deleted and replaced with a non-harmful portion of nucleic acid from a rhinovirus. As a result, due to some complex molecular biology explained in adR. Gromeier's peer-reviewed article linked to below, the modified polio virus can no longer replicate in normal cells, but it can infect, replicate in, and kill the glioblastoma cell it enters. This apparently serves the purpose of mobilizing the patient’s own immune system to attack other glioblastoma cells, and this immune system activation may well be the key to eventually destroying the entire glioblastoma. Dr. Gromeier says the following. "All human cancers, they develop... protective measures that make them invisible to the immune system and this is precisely what we try to reverse with our virus. We are actually removing this protective shield... enabling the immune system to come in and attack." 60 Minutes cameras spent nearly a year chronicling the ups and downs of this novel experiment. As the researchers struggled to determine how the virus would behave, their hard decisions sometimes led to tragic consequences for participating patients. Eleven of the 22 participants in the experiment succumbed to their diseases. In particular, the program highlighted one patient who died after the dose of polio virus had been increased three-fold following early successes at a lower dose with two patients. This higher dose perhaps led to over-stimulation of the immune system and a degree of associated inflammation that the brain could not handle, although this has not been definitively determined. Now, doctors believe the re-engineered polio virus starts killing the tumor, but that the body's own immune system does the real killing. And, as already suggested, in two patients suffering from glioblastoma, a notoriously fast-growing and lethal form of brain cancer, doctors cannot detect any glioblastoma three years after they received the polio virus therapy. But are they cured? Dr. Fritz Andersen, a retired cardiologist was one of those patients. "I feel it's a cure and I live my life that way," he told Pelley. Another patient Pelley met and interviewed, Stephanie Lipscomb, was just 20 when she was diagnosed with a glioblastoma. She also has been declared cancer-free after one dose of the medicine three years ago. Darrell Bigner, M.D., Ph.D., is the head of the phase 1 study at Duke. He is also Director, The Preston Robert Tisch Brain Tumor Center; Director, the Pediatric Brain Tumor Foundation Institute; and Chief, the Preuss Laboratory for Brain Tumor Research; all of which are at Duke. Dr. Bigner is considered one of the leading authorities on brain tumors in the world and he was interviewed briefly toward the end of the 60 Minutes segment. He told Pelley that he had never seen results like those in Fritz Anderson and Stephanie Lipscomb in his almost 50-year career. Dr. Gromeier noted that he is presently testing the polio-virus-based therapy on numerous other solid tumors in test-tube studies.